Greetings from newly-minted motherhood, complete with a rapidly-growing number of milk stains (*sigh*) and much happiness, courtesy of my new little snuggle-bundle! So what will ‘Eye For Elegance’ become? Understandably, my priorities are shifting to include my little girl in my thoughts and sensibilities (e.g. current garment priorities: ease of stain-cleaning and quick nursing access) and she’s a large part of my personal life, so elements of her presence are bound to spill over into the blog. That said, ‘Eye For Elegance’ will continue to be my personal narrative of how to live confidently, elegantly and with poise and ease, covering life philosophy, style, beauty, health and aesthetic (DIY, entertainment) topics. I’ll sometimes incorporate newly-gained parental perspectives, but I’ll make sure that my content remains relevant across age and life-stage ranges. Today, it’s all about family nutrition and health. Given my focus on self well-being and enjoyment of food, I hope to set up my family for nutritional success. 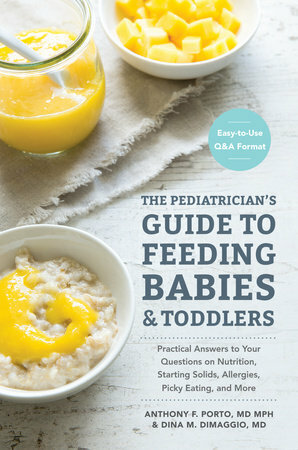 I recently read ‘The Pediatrician’s Guide to Feeding Babies and Toddlers‘ by Anthony F. Porto, MD MPH and Dina Dimaggio, MD, and am glad to have their approachable yet authoritative narrative for family nutritional guidance. The pediatrician authors are parents, and have created a book that is structured to well-address parental questions and concerns. Worth noting are their 1) month-by-month nutritional needs and recommendations, 2) recipe inspiration for the entire family, and 3) Q&A-format of food concerns (e.g. allergies, unsafe foods, and gastrointestinal issues). Reference tables and graphs break out age-appropriate foods (as well as reasons why) and guidelines of baby growth and development. The book is broken into sections by baby’s age (on a monthly basis). Each section discusses 1) baby development milestones for that time frame, 2) nutritional guidelines, 3) expected weight growth, 4) age-specific concerns (ranging from milk spit-up to potty training), and 5) healthy recipes for baby and the rest of the family. The book also addresses other food concerns such as food choking hazards (one of my largest personal fears! ), food allergy symptoms, and tips on feeding a picky eater. Calcium: important for ‘muscle and nerve function, bone and teeth health, and blood clotting‘, found in ‘breast milk and formula, yogurt, milk, cheese, fortified orange juice, tofu, salmon, kale, and sardines‘, and has a recommended daily intake of ‘2 mcg for 0-6 month olds, 2.5 mcg for 7-12 months, 30 mcg for 1-3 years, and 90 mcg for lactating mothers‘. Eggs: ‘can be introduced at 4-10 months (but recommended to be introduced between 6-8 months)‘ in ‘scrambled, hard-boiled, or baked-good form‘. A follow-up recipe for zucchini carrot puree can be eaten as-is for infants, or incorporated with eggs into a zucchini carrot souffle. I love the building-block recipe format! In a large bowl, mix together the oats, flour, cinnamon, baking powder and salt. Mix the bananas, applesauce, butter, peanut butter, dried fruit (if desired) and vanilla in a medium-sized bowl. Pour the banana mixture into the flour mixture and mix until just combined, then mix in the chocolate chips. Let the mixture rest for 10 minutes. Using a tablespoon, scoop the batter onto a parchment-lined baking sheet, leaving 1 inch between cookies. Bake for 20 minutes. Cool and serve or refrigerate for up to 2 days or freeze for up to 1 month. 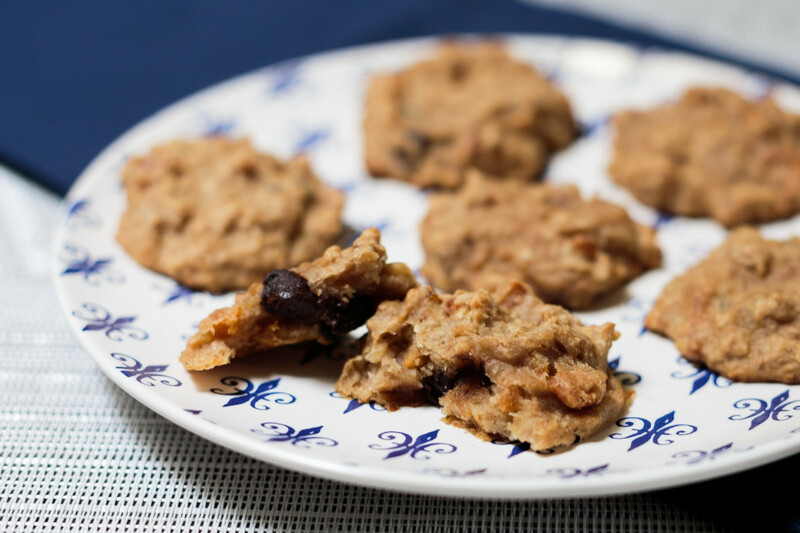 I used dried apricot in my cookies, but I found it had too many conflicting flavors for my preference (peanut butter, banana, chocolate chips, and dried apricots all have distinct, assertive flavors), so I recommend either using a mild-flavored dried fruit such as apple, or omitting it entirely. I also added applesauce to make a more moist cookie that spread better while baking (the original recipe yielded dense, rounded mounds versus a cookie-like consistency). 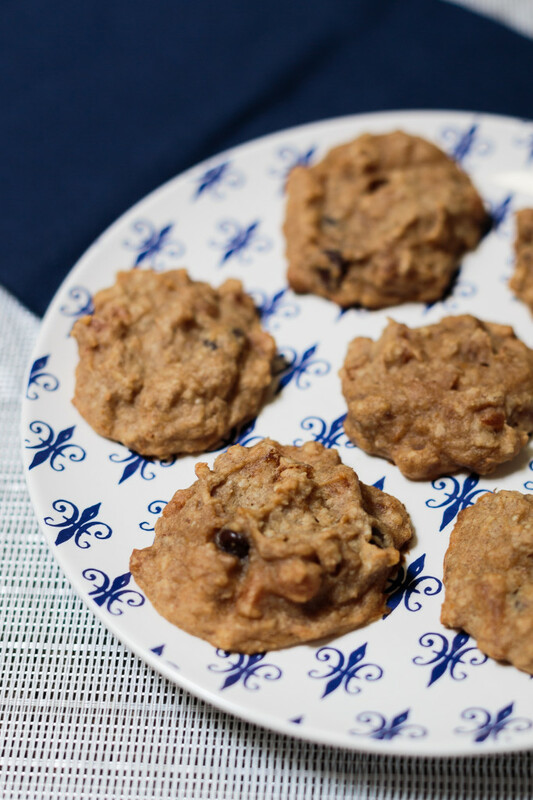 To properly set expectations, it’s not a dessert-like cookie… it’s more like a lighter, freshly-baked alternative to an energy bar that you can serve to your family without guilt. Delicious as a quick, energizing breakfast bite or snack!